Welcome to Kenny Lessing's Text Ad Sender. How TextAdSender.com works. 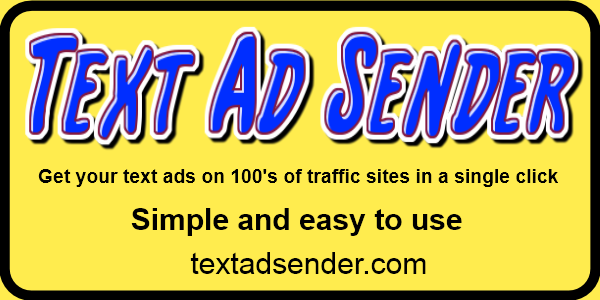 You can purchase an Text Ad Pack of 10000 impression for just $2.99, After your Ad is set up, it is shown on quality advertising in the form of text ad impressions. Your Add will show on plenty of sites, in-fact we have partnered with 100s and 100s of hi volume traffic web sites, blog web sites and more. We will drive traffic to your web site or affiliate links. WE, AT THIS SITE, DO NOT SEND ANY E-MAIL AT ALL. This is no membership and nothing to join, you can come back at anytime and check out ad stats! Get a lifetime ad for just $99.00. Text ad sending at its finest. If you are a site owner and would like some displays, please contact us.